Guwahati, Feb 16: The environmentalists urged the government to reserve spaces for the greater adjutant stork, a rare member of stroke family, which is found in Assam besides in some of the South Asian countries, is fast decreasing to be categorized as highly endangered species. With the urbanization the habitat areas of this bird is decreasing leading to the death of the new borns and the mature ones. “Not just the population but the distribution and the nesting habitation are declining day by day. We urge the government to plant trees in the dumping areas in Boragaon area in the city besides preserving its habitat areas in other parts of the state. So that we can save the species before it is vanished,” said Mriganka Krishna Gogoi, founder director of Friends of Nature, an NGO working in environmental issues. According to census there were around 800 to 900 individuals in the state and later in the year 2005-06 it came down to 500. Whenever the number of any species comes down to 500, it is categorized as highly endangered. “Gradually the number is seriously decreasing. It’s everybody’s responsibility to make its life easier to save them so that the bio-diversity remains balanced,” said Hillol Jyoti Singha, a professor of Birjhara College of Bongaigaon who conducted a study on this species. Besides, in several places in the city, greater adjutant stroke is found in Jorhat, Dibrugarh, Kaziranga and in some parts of the state. As this bird prefers to stay in the riverside forests and with the deforestation its habitats are losing out. A latest census conducted in the city recorded presence of 127 birds. Its population was 288 in 2002, 207 in 2003, 233 in 2004, 247 in 2005, 167 in 2006, 118 in 2007, 149 in 2008, 147 in 2009 and 113 in 2010. 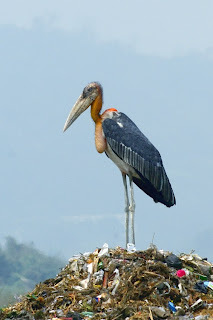 While, the global population of the greater adjutant stork is estimated to be around 900-1,000.